Modern conveniences, we are surrounded by them, so much so that we take most of them for granted, until we don’t have them. I’m not against having modern conveniences. They have made life easier and given us all more time for things we enjoy. But neither can the individual who will survive become so much a slave to luxuries that they cannot do without them. It is a fact that disillusionment and the paranoia that follows it are the biggest killers among people thrust into a survival situation. Yes, there was a time people lived closer to the Earth. They experienced the outdoors everyday. In our modern culture most people have become far removed from this connection. This book draws off of the skills that primitive people have used for thousands of years and applies these skills in such a way to show the modern day survival student how they too can survive in the outdoors. The knowledge you will obtain from reading and practicing the skills described in this book could very well save you and your loved ones’ life. Once you experience the outdoors on this level you will never look at the outdoors the same way again. 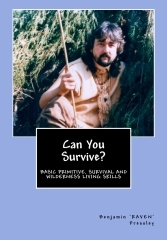 This just may be the most comprehensive book on survival on the market! Full of great original instructive drawings and photographs! Available in paperback and e-book. ORDER 10 OR MORE PAPERBACKS FOR ONLY $10 EACH PLUS $8 SHIPPING! GREAT FOR TEACHING A CLASS! ANOTHER BOOK REVIEW BY MIKE MARSH OF THE GOLDSBORO NEWS.Mike also relates his story of how he made fire with bow & drill by following the instructions in Raven’s book.